Protesters demonstrating against police violence entered St. Louis Metropolitan Police Department headquarters demanding their non-violent comrades' release -- and some of them left with a face full of pepper spray. Roughly 75 protesters surrounded the department at about 10:30 a.m. with an "eviction notice" as well as demands that they get meetings with department officials, including Chief Sam Dotson and Mayor Francis Slay, according to FOX 2. They planned to occupy the headquarters for four and a half hours. About 15 of those protesters actually got inside and called for amnesty for protesters charged with non-violent offenses, and the termination of St. Louis officers like Jason Flannery, who shot and killed VonDerrit Myers while off duty in October. When police tried to remove those protesters, chaos ensued. Some protesters were pepper sprayed on camera, and five people were arrested. Four of those were charged with trespassing and disturbance of the peace, while one man was charged with third-degree assault for allegedly attacking a City Marshall inside the building. Outside, hundreds of eviction notices were plastered on the headquarters walls. 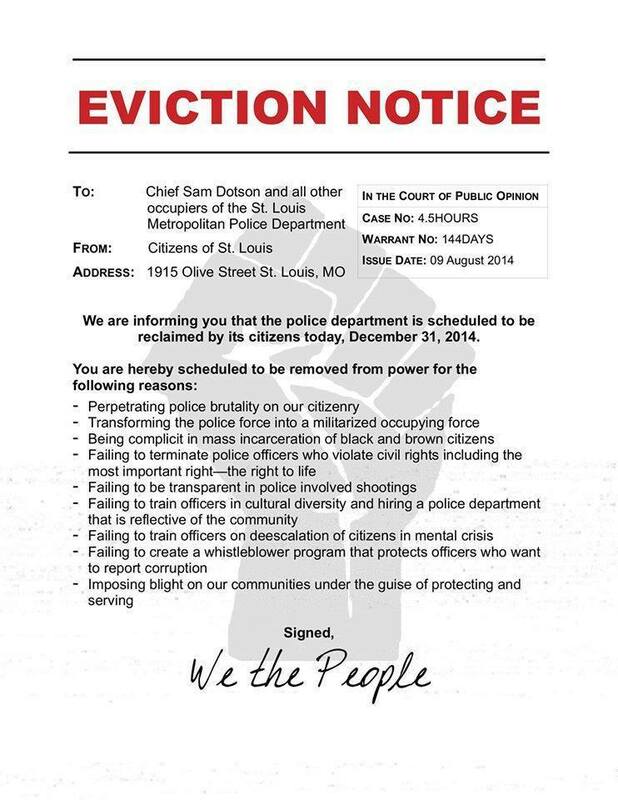 It reads, in part: "We are informing you that the police department is scheduled to be reclaimed by its citizens today, December 31, 2014." The protest began as a "March to the Arch," a planned New Year's Eve event in St. Louis.